For a base camp I like to bring lots of equipment. At my cooking station I have a two burner gas stove that’s fueled from propane bottles. The gas flame can be easily controlled just like the ones in your kitchen. I like to do my cooking in an area that has an excellent view of the surroundings. That makes the chore of cooking a pleasure. I also like to include a propane barbecue grill, along with a briquette charcoal grill. I also include an assortment of Dutch ovens. 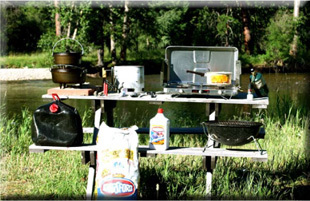 A cast iron grill and frying pan are also useful. For the Dutch oven I include a couple of brick pavers and a stove pipe charcoal briquette lighter. I also have in the shade several gallons of drinking water. For warm water I like a six gallon black Reliance water bottle. It is left in the sun so the sun’s rays on the black plastic can quickly warm up its contents. This Reliance container has a spigot which can dispense the warm water to wash in which makes washing up more enjoyable. I also have my cooking utensils and a supply of propane and charcoal briquettes. I like all of this equipment in the same place. It makes it easier to cook and keeps things clean. I also like to set up a lounging area. It consists of a couple of reclining lounge chairs and a fold-up table. A cooler filled with ice is nearby with cold drinking water and beverages. my picnic basket with plates and utensils. A colorful plastic tablecloth is taped over the table to provide a clean place to eat. This also keeps my cooking supplies out of the morning dew and dry in rainstorms. Its shade provides a cool place for my coolers. On the opposite side of the screen tent I have a portable shower. The black Reliance water container provides warm water for a shower. This shower enclosure provides privacy while bathing. The enclosure is hung from the rafters of the screen tent and has a little attachment for a shower head. I also like foldable cedar plank flooring that fits under the shower enclosure. This keeps your feet clean and up off the ground. It’s not pleasant to have muddy feet after showering. A warm shower at the end of the day makes the base camp an enjoyment. The bathroom facilities consist of a folding camp shovel with a roll of toilet paper on its handle. This is a simple bathroom fixture. 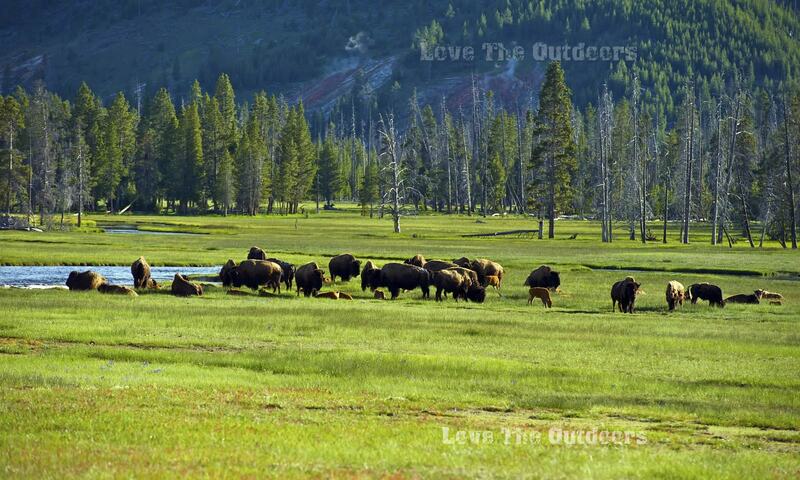 There are a lot of great private bathroom locations in the great outdoors. Make sure your waste is buried in a shallow grave at least 200 feet away from any water source; the bacteria in the soil will break down your waste. They’re both biodegradable. A base camp provides a comfortable living arrangement. It can be a pleasure to camp up to a week or two. It has the basic comforts of home. 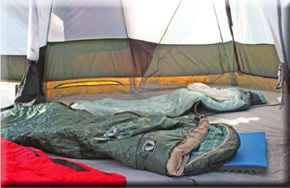 The sleeping arrangements in the three room tent consist of the following: outside the front door a small tarp is staked down. This provides a clean area for you to take off your shoes. Dirty shoes and the inside of tents don’t mix. Since the tent has a waterproof bathtub-like floor, soil tracked in from shoes is a problem. Stocking feet inside the tent are preferred to help keep it clean. In the front part of the tent is a vestibule for gear. The other two rooms are roomy sleeping quarters. 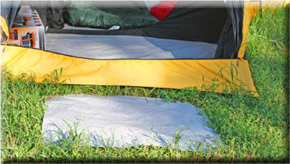 All you need is a nice thick pad and a roomy sleeping bag which makes for a luxurious bed in the outdoors. You’ll be surprised at how well you can sleep. It’s so comfortable that it’s hard to get up in the morning. The cool summer’s eve air makes for a deep, restful sleep. 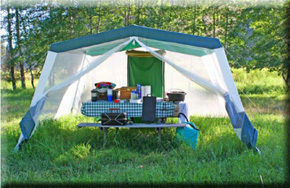 This three room tent is equipped with a rain fly and an abundance of mosquito netting. This prevents moisture condensation and provides fresh air. If you know that it’s not going to rain, it’s fun to sleep out under the stars; simply take off the rain fly and you can easily see through the mosquito netting. I’m amazed at the number of stars that you can see on a dark night in the wilds. This is a refreshing change from your bedroom home in the city. The sleeping quarters also have built in pockets to store your keys and wallet along with places to hang out your clothing. 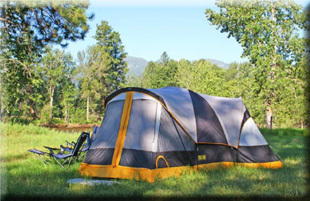 A large tent provides ample room for comfort. The equipment I have shown you costs only about $500. If you properly take care of it and store it correctly, it can last for years. 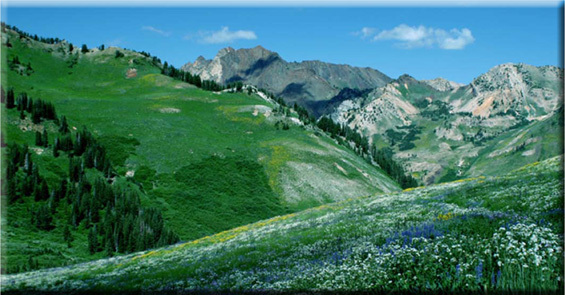 This makes base camping an extremely inexpensive way to experience the great outdoors. Some of my equipment has lasted me over 20 years with proper care. This makes camping a genuine bargain. During times of high fuel prices you can save on the hotel and restaurant bills. With this base camp you can stay out as long as two or three weeks. Since your camp is where you want to vacation, you don’t waste time and money driving all over the place.